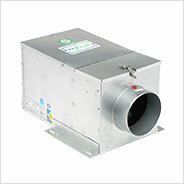 reFresh Full Size Units | S&P Canada Ventilation Products, Inc. Applies to models without a "-P": WARNING: This product can expose you to chemicals including lead, which is known to the State of California to cause cancer and birth defects or other reproductive harm. For more information go to www.P65Warnings.ca.gov. RF10-160EC, RF10-160EC-ES24V, RF10-160EC-P, and RF10-160EC-P-ES24V models are recognized as the Most Efficient of ENERGY STAR 2019. Note: ES24V control mounted on the interior of RF8 units.